B—BOSH Director: The BOSH Director tile always deploys, so its Apply Changes checkbox is always enabled. C—Depends on: This section lists tile dependencies and versions. If you choose to deploy a tile that has dependencies, you must also deploy all of that tile’s dependencies in the same deployment. 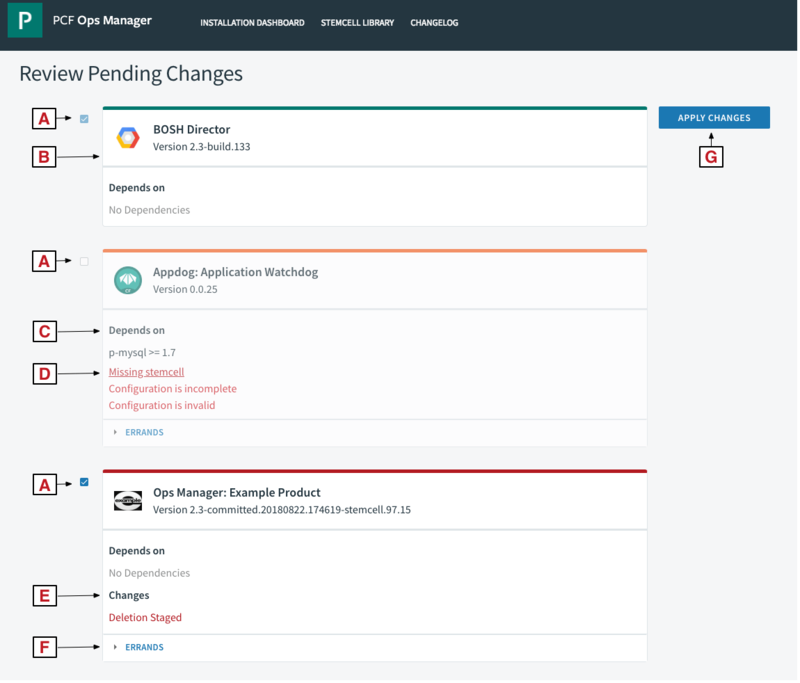 E—Changes: This section lists high-level pending changes to the product that Ops Manager has not yet attempted to deploy. When Ops Manager tries to deploy a product but the deployment fails, it clears this list and the pending changes are retained for the next deployment. To see if your product deployed successfully, see Change Log Page. F—Errands: If you expand this section, you can enable or disable errands that trigger when that tile deploys. For example, you may enable an errand to log properties. For more information, see Managing Errands in Ops Manager. G—Apply Changes: Clicking this button deploys all enabled tiles.